Sir Dayvd's post yesterday got me thinking (and then Google-ing). That's where I discovered a guy with a true Knight spirit. 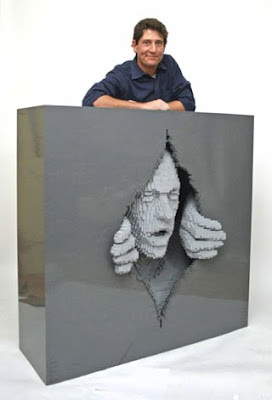 Some artists use paint, others bronze – But for Nathan Sawaya he chooses to build his awe-inspiring art out of toy building blocks. LEGO® bricks to be exact. With more than 1.5 million colored bricks in his New York studio, Sawaya’s sculptures take many forms. So let Sawaya know what you have in mind, there are literally no limits to what he can create out of LEGO. Like I said, I LOVE LEGOS! I believe they satisfied my creativity at an early age. Awesome art. The last pic looks like me on the operating table during my Open Heart! 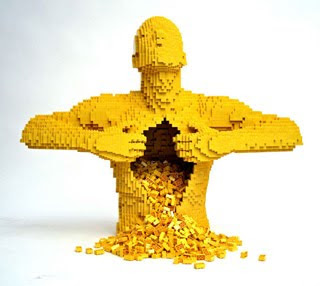 Yeah this rocks :)) Everyone can identify with a Lego brick and so can fully appreciate the work and skill that goes into these works, which is more than you do normally do for any other type of sculptures. wonder if my nephews still have the many Lego kits they had when they were kids? the pirate ship was always cool!